TORONTO: In large part, Mohamad Malas' "Ladder to Damascus" is what a casual observer might expect: a film about a country in crisis. Given the political travails that have shaken his country since 2011, you might anticipate a lightly fictionalized documentary treatment of the Syrian people's struggle against the Baath regime. If so, the film casual observers find won't be at all what they expect. The latest feature by the 68-year-old Syrian auteur - his first since "Passion" (2005) - had its world premiere at the Toronto International Film Festival Sunday evening, only one of the festival screenings that TIFF insiders say was sold out days in advance. "Ladder to Damascus" tells the story of Ghalia (Najla El Wa'za), a young woman from the coastal town of Tartous, who is haunted by memories of a woman she never knew. Zeina, who was also from Tartous, walked into the sea in the 1980s, before Ghalia was born. Her suicide was an expression of despair after her father died in security service detention. Ghalia studies theater in Damascus - that being the best way to give form and meaning to Zeina's memory. While presenting a dramatic monologue inspired by her muse, she meets Fouad (Bilal Martini), a fellow student who is so obsessed by film that he's acquired the nickname "Cinema." 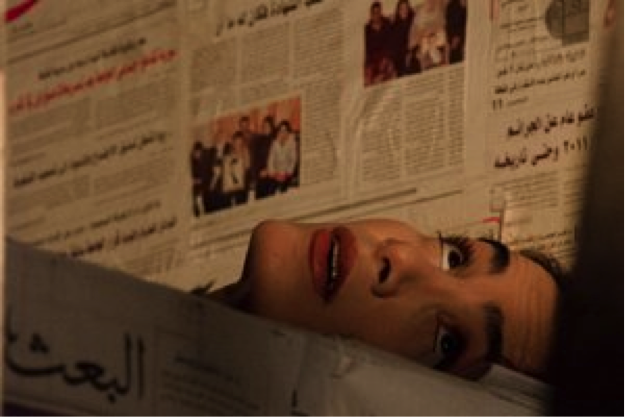 He films Ghalia onstage and begins to fall in love with both her and her dead muse. Fouad tells Ghalia that he wants to make a film about Zeina and that he wants her to act the role. She soon travels to see her parents, but is compelled to return to Damascus to help Fouad tell Zeina's story. He finds her a room in his communal house in the Old City - it seems these interior sequences were filmed in the historic, extramural quarter of Souq Sarouja. An Ottoman courtyard house, it's owned by Umm Sami (Rana Malas), who rents her many rooms to a cluster of young adults drawn to Damascus to pursue their dreams. Many of Fouad's housemates are artists and intellectuals, and Malas (and his young co-writer Samer Mohamed Ismail) makes Umm Sami's house a classic microcosm of Syria's social and cultural diversity. Zarzour (Mohamad Zarzour), for instance, is a philosopher who, when not reclined behind the mosquito netting about his bed, spends his days reading on the swing he's rigged in his room. His girlfriend Lara (Lara Saade), who sometimes joins him within the mosquito netting, is a graphic designer from Homs who wears a cross around her neck. Rana (Roula Falhout), a sculptor from Suwayda (the main town in Jabal al-Druze), has created a clay figure standing behind a door who's detached its head and holds it up so it can see out the barred window. Malas' camera returns to the sculpture repeatedly. There is a Palestinian boxer pummelling the heavy bag hanging in his room and a journalist, named Hussein, who's lined his entire garret - immediately over the rooms of his chaste lover Nawara - with newsprint. A room suddenly became available at Umm Sami's, Fouad explains to Ghalia, because one of his flatmates had to leave. She's Alawi (a sect of Islam, members of which dominate Syria's Baath party), he confides with a whisper, and the police didn't want her associating with Umm Sami's rabble. Malas' film is an indictment of the Baath regime - in whose shadow he has spent his entire career, receiving permission to shoot films in Syria but seldom allowed to screen them there - but it doesn't stretch a fictive fabric over an easily digestible documentary skeleton. The closest he comes to documentary is an early gesture to his friend and colleague Omar Amiralay - specifically his 1976 documentary "Everyday Life in a Syrian Village" - who died just as revolt took hold of Tunis. In this, "Ladder" is utterly unlike some of the other movies that have emerged from the "Arab Spring." Ibrahim Batout's "Winter of Discontent" (2012), for instance, a fiction about Cairo's 2011 revolution, looks like furtive docudrama alongside Malas' work. A graduate of Moscow's prestigious Gerasimov Institute of Cinematography, Malas is among several Syrian filmmakers whose work has been formed within the crucible of Russian formalism - a point well made in "Insights into Syrian Cinema," the 2006 collection edited Rasha Salti, who also programmed Malas' film for TIFF. The filmmaker's past works may all be read as "political," while lacking direct (at any rate easily discernible) references to contemporary politics. Like his formalist colleagues, Malas sublimated and sieved his regime critique through highly aestheticized approach to narrative. The politics of "Ladder" are direct, and the film does sometimes suffer from its unfiltered expressions of rage. Yet the visual language remains aestheticized - beautifully so, thanks to cinematographer Joude Gorani. Naturally the result will baffle any audience watching this film simply to find out what's going on in Syria. The process of making "Ladder" was quite unlike that of his earlier films. The shoot began in the wake of the first demonstrations in Syria. Without official permission to film in the midst of the ensuing security clampdown, he continued to shoot surreptitiously. It was dangerous labor and Malas' sound engineer, Ghanem al-Mir was arrested during the shoot. It's hardly surprising that "Ladder" pulls no punches in expressing the filmmaker's anger. "I live in a country that gives me nothing," Fouad tells the camera in the film's opening scene, "but demands everything from me ... [including that] I live in fear." This is only the first of dozens of indictments. Setting the opening scene is a white sheet that represents a film screen, one that Fouad tears down before making his introductory declaration. The sheet only "represents" a screen because, rather than simply projecting a film upon the sheet - as he does several times later in his work - Malas projects film that been blacked-out. If events are not recorded, the film states, they swiftly cease to exist. In this, Fouad plays various roles. The plot is marked by Ghalia's encounters with her muse. Zeina's silent apparition (Gianna Aanid) begins to appear once she moves in to Umm Sami's house. At times, Ghalia appears to be possessed by the dead girl - whose family house happens to be just down the lane from that of Umm Sami. Fouad also projects classic films on his bedsheet screen, which allows Malas to deploy cinema to shine a light on oppressive regimes that have been the subjects of past films. Fouad also shares the rushes from his own film about Zeina - specifically a sequence in which her father speaks to his daughter from behind bars, lamenting how his generation's revolutionary ardor was crushed by an authoritarian regime. The film believes that to film someone is to resurrect their likeness, rendering them eternal without the hocus pocus of metaphysics. In this Malas expresses an optimistic faith in the power of image, and of cinema in particular. It is far more difficult to consume than docudrama. It is also far more powerful.